Superb line-up of men on Invanskrue (INTONEMA int025) turn in two sets (one under-stated, the other a glory of sustained simmering chaos) of electro-acoustic improv containing much drone, rattling, and concentrated hummery. 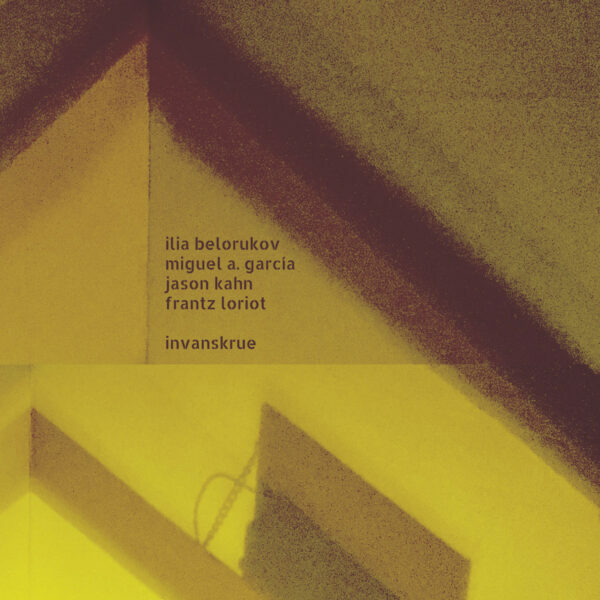 The four friends are familiar faces in these here parts – Ilia Belorukov, the Russian mover and shaker; Miguel A García, Basque king of prolific evil noise emissions; Jason Kahn, the cerebral drummer and composer; and Frantz Loriot, who has lent his viola skills to many good records lately (most memorably as one quarter of Im Wald). Note the “gender balance” of acoustic and electronic instruments in that set-up, though you might want to add a third strain of “digital” if you count laptops and samples in the latter category. As to balance, Belorukov may seem to be hogging the lion’s share of tools on the table if you include his field recordings and pedals along with his contact mics and the IVCS3 machine (though he has forsaken his usual saxophone feeding back or otherwise), and while he is exhibiting his unfortunate tendency to overdo things and fill in too many spaces, the whole record emerges as a group effort. On the first swipe, fourteen minutes of ‘janotaticker’ show the foursome merging and melding into the expected unicorn of compatibility which is the usual goal of this mode of free playing, but the return bout ‘relieffestia’ is superior in anyone’s box of dominoes; twice the length, far more “eerie” in its mood of spectral dissonance, more agitated in the playing strokes and hammering actions, and the instruments all rise to the fore to create distinctive voices and characters. This kind of “separation” used to be “taboo” some 18 years ago, when the constraints of the EAI rulebook seemed to require that all players must melt into a fuzzy goo right there on the stage. Not just the sound of their instruments, but their brains and bodies too; it caused quite a mess and needed careful therapy to revert the situation. I’m particularly digging the uncertain and unsettling strokes of Loriot, as his bow trembles like a palsied old man dreading the onset of the plague. Kahn meanwhile is hammering out a form of godless cross-breed between a West Coast trap set for a Gerry Mulligan sesh and matchbox-sized version of Les Percussions de Strasbourg. It’s left to García to provide a reliable under-layer of fizzing burble to the day’s work, but one senses he’s pulling in his horns to some degree and watering down the sheer bile and hostility that sometimes informs his work. And who wouldn’t want to do that, in such great company. This particular plate of mashed swede was recorded in Zurich when the four of them were on an ambassadorial visit to the Swiss Diplomats Network. The day’s work turned out well and they were all mingling in the hotel lobby for champagne by six pm. Moralité: the next time Invan’s Krue come knocking, you’ll know where to turn. From Feb 2018.